Flouro pink tulle over a dove grey day bed. Surprising. Modern. Easy! And if I'm not mistaken Do-it-yourselfers, that would be the Ikea Hemnes day bed ($599), painted a warm grey. Best thing about this room is that the pink is easily "removed". But why is this important? 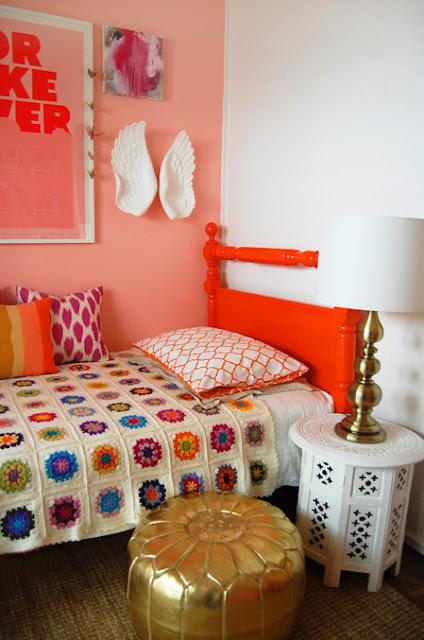 People keep telling me girls go right off pink when they hit 5 or 6, so I was reluctant to feature it too heavily in Anoushka's room (below), which she adores regardless. In the case of the above room, simply substitute a different colour piece of tulle or even a patterned fabric, and change blankets/throws. This is a good kid's room "formula". I'm giving it a gold star.